Northumbria Police is investigating the robbery. A shop boss was left hurt in a robbery which saw more than £2,000 taken from the store in a morning raid. Northumbria Police has said the hooded thief struck at the Smilers News Store in Horsley Hill, South Shields, with what is believed to have been knife. A force spokesman said: "He walked behind the counter where he confronted the shop keeper before making off on foot with around £2,040 in cash. "The shop keeper suffered minor injuries and was left shaken by the incident. "An investigation is ongoing to determine the circumstances behind the incident and locate those responsible." The offender is described as a white male, about 5ft 9ins, thin build and was wearing jogging bottoms and a hoodie, with the robber's face covered by the top during the incident. The attack happened at 9am on Sunday. 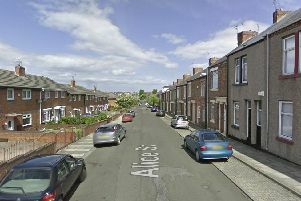 Northumbria Police say officers are keen to hear from anyone who might have information about this incident and would ask they contact 101 quoting reference 278 170319 or Crimestoppers anonymously on 0800 555 111.